While it nailing the little details, this box whiffs on some important things. The mere existence of Amazon’s Fire TV Recast is a testament to how popular cord-cutting has become. Over-the-air DVR was once the domain of geeks whose living rooms ran on Windows Media Center. But as more people have dropped cable TV, we’ve seen more user-friendly approaches from the likes of TiVo, Tablo, Plex, Channels, and AirTV. 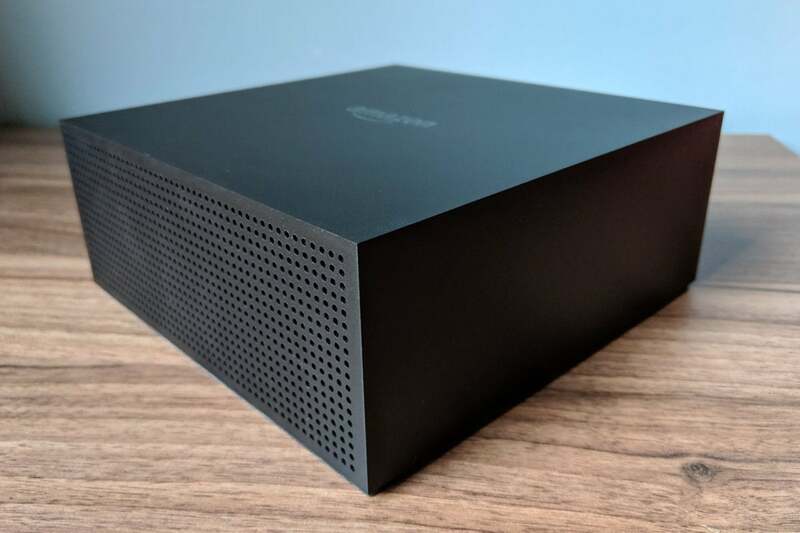 Those options presumably helped inspire the Fire TV Recast, a $230 box that records free broadcast TV channels from an antenna and streams the video to Amazon’s popular Fire TV devices. The Fire TV Recast is the most mainstream attempt yet at over-the-air DVR, and it shows in Amazon’s simple and polished software. The Recast is also cheaper than most other options due to its lack of subscription fees. Still, Amazon’s DVR has several major limitations—most notably the need for a Fire TV device to watch on televisions—that will make it a non-starter for many cord-cutters. One thing hasn’t changed over the years: The perfect cord-cutting DVR still eludes us. 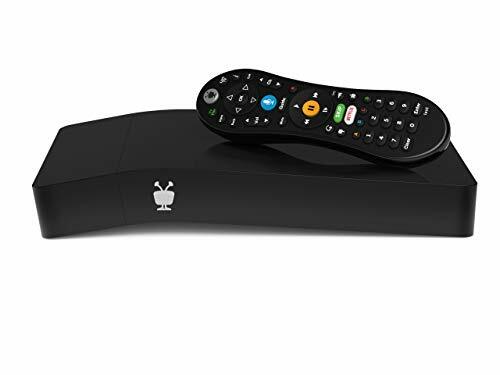 Unlike a traditional DVR, such as TiVo, the Recast does not plug directly into your television. Instead, you can place it anywhere in the house, and it’ll stream broadcast channels to your Fire TV, Fire tablets, iOS devices, and Android mobile devices over Wi-Fi. (The Recast also has an ethernet port for a wired connection to the router, but you’ll need to supply your own cable.) It’s compatible with any antenna through its coaxial input. The Fire TV Recast works with any antenna, and it has an ethernet jack if you don’t want to rely on Wi-Fi. The USB port will support external hard drives in the future. Amazon clearly gave some thought to the potential hassles of a networked DVR. Rather than making users connect an external hard drive, Amazon included a 500GB drive in the $230 dual-tuner model, which is good for 75 hours of HD video. There’s also a 1TB model—that’s enough storage to record 150 hours of HD video—with four tuners for $280. While the Recast does have a USB port that will eventually support external storage, it’s not necessary to record plenty of shows. The Fire TV mobile app also does a good job with the setup process, offering plenty of guidance on where to place your antenna before connecting the Recast to Wi-Fi and scanning for channels. It even suggests a side of the house for installation, using your location and antenna range to figure out which direction is exposed to the most broadcast towers. Amazon’s Fire TV mobile app helps you figure out the best place to install the Recast. You don’t even need to install any additional apps once the Recast is set up. Any Fire TV devices on the same network will discover the DVR automatically and add a new “DVR” section to the top menu bar. You’ll use the same Fire TV app for mobile streaming that you used for the installation. The Fire TV Recast’s biggest drawback is that you need a Fire TV device to watch on televisions. Recast is incompatible with non-Amazon media-streaming devices such as Roku, Apple TV, Chromecast, game consoles, and most smart TVs. You can mirror an Android phone’s screen to Chromecast, or an iOS device’s screen to Apple TV via AirPlay, but the screen must stay focused on the Fire TV app the entire time. This is not a great workaround. 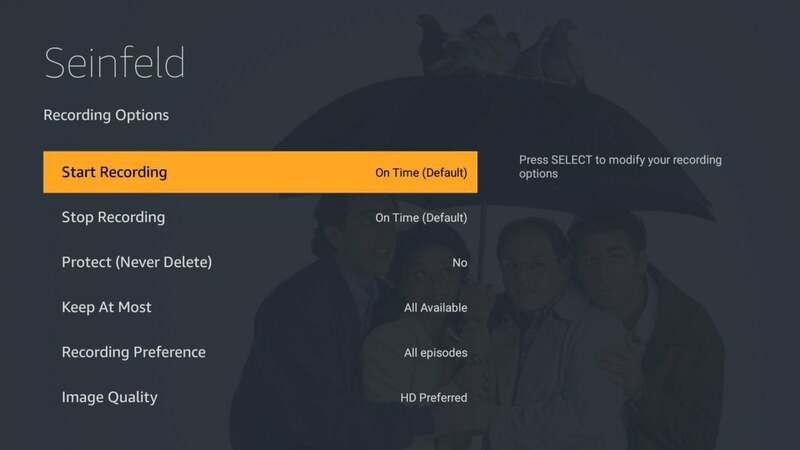 The Fire TV automatically adds a DVR menu when the Recast is on the same network. If you’re all in on Fire TV, on the other hand, the Recast’s integration turns out to be its greatest strength. 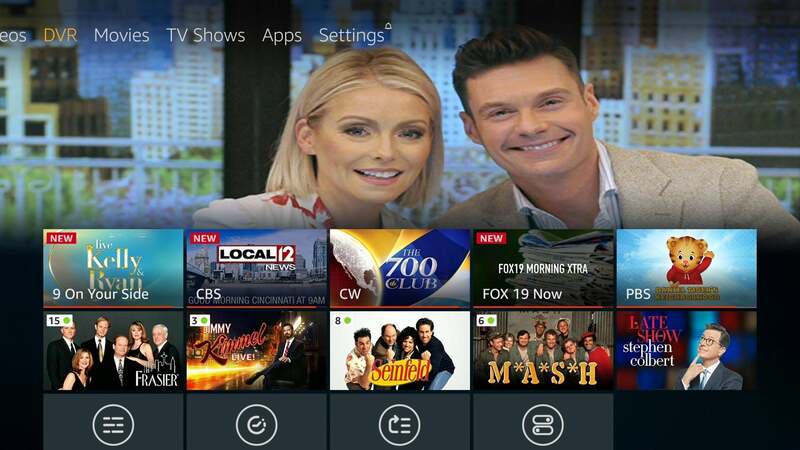 Instead of jumping into a separate app, you can access live channels, recordings, DVR settings, and a grid-based channel guide straight from the Fire TV’s DVR menu. 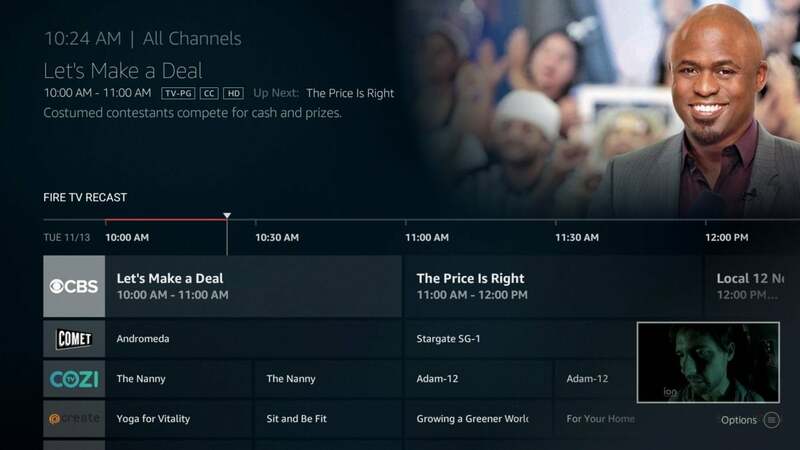 Amazon also weaves over-the-air programming into other parts of the Fire TV interface. The “Recents” row on the home screen includes your most recently watched channel, for instance, while the “On Now” row lists all channels. You can even use the Fire TV’s search function to find over-the-air programming by name, actor, director, or genre. 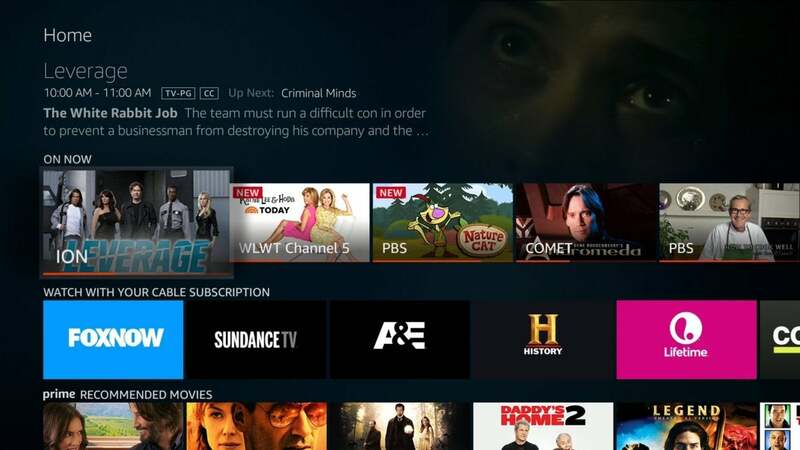 Amazon’s grid guide also supports streaming sources such as certain Amazon Channels add-ons (including HBO and Showtime), Pluto TV, and PlayStation Vue. If more sources like Philo and Sling TV were to support that guide, it could become a powerful way to get all your live TV in one place.. 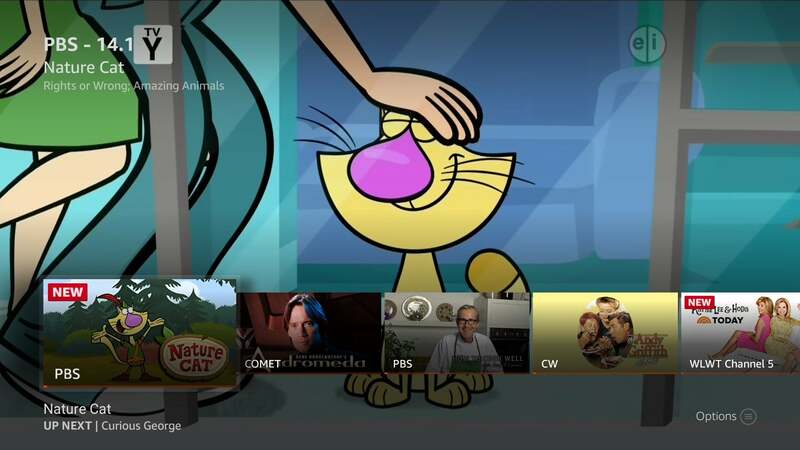 The Fire TV puts Recast’s over-the-air channels right on the home screen. The Fire TV Recast also works with Alexa voice commands, so you can use the Fire TV voice remote or an Amazon Echo speaker to launch live channels, play your recordings, open the channel guide, delete recordings, and check on storage space. 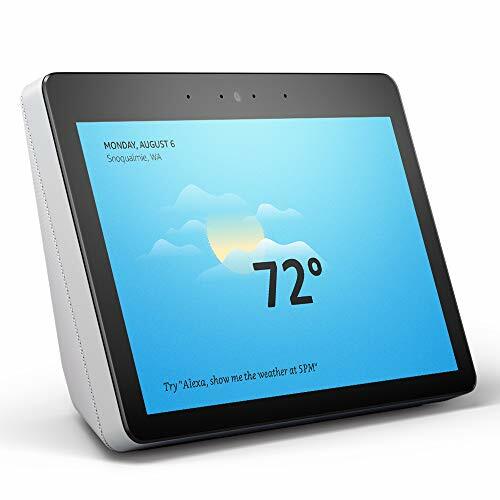 If you have an Amazon Echo Show smart display, you can play over-the-air programming on that device as well. Amazon hasn’t ruled out supporting other streaming devices in the future. (The company merely says it won’t comment on future plans.) But even if the Fire TV Recast does eventually work with devices like Roku and Apple TV, the experience will always be better on Fire TV thanks to its home-screen integration and voice controls. Yes, there’s a grid guide. When it comes to recording live TV, Amazon has a strong grasp of what cord-cutters might want. Like most other DVRs, the Fire TV Recast supports series recordings, and it offers lots of granular control over what gets saved. You can add start and stop buffer times, protect recordings from deletion, keep only a certain number of recent episodes, record in HD or SD only, and avoid recording reruns. You can also rearrange the priority of recordings, so when a conflict arises, the Recast will offer to cancel the lowest-priority program on your list. No shortage of recording options here. The Fire TV Recast does a fine job with live TV as well. Whenever you tune to a live channel, the Recast automatically starts creating a buffer, so you can pause and rewind without needing to create a recording first. Pressing down on the Fire TV remote also brings up a mini-guide, so you can see what else is on without closing or minimizing the current program. Still, Amazon’s recording options aren’t quite as rich as Plex, TiVo, or Tablo. You can’t schedule recordings manually, and the maximum buffer time of one hour for series recordings could be an issue for extra-innings baseball games. The Recast doesn’t support series passes for specific sports teams, either, so you’ll need to record every NFL broadcast instead of just your home team’s games. Amazon’s mini-guide doesn’t get in the way of live TV. The biggest omission, though, is an easy way to avoid ads, akin to TiVo’s SkipMode button and Plex’s automatic ad deletion. The best that the Fire TV Recast can do is fast forward in 30-second increments. With every other networked DVR I’ve tested, there’ve been problems delivering smooth frame rates across all channels. Tablo, for instance, tops out at 30 frames per second for channels that broadcast in 480i or 1080i. Plex only supports 60-frames-per-second video on those channels for certain devices, such as the $180 Nvidia Shield TV. Channels DVR can manage 60 frames per second on all channels, but Fire TV devices struggle to handle this unless you disable transcoding, which uses less bandwidth. AirTV doesn’t do 60-frames-per-second video at all. In practical terms, not having 60-frames-per-second support means video will look choppier than cable for sports, news, and talk shows. 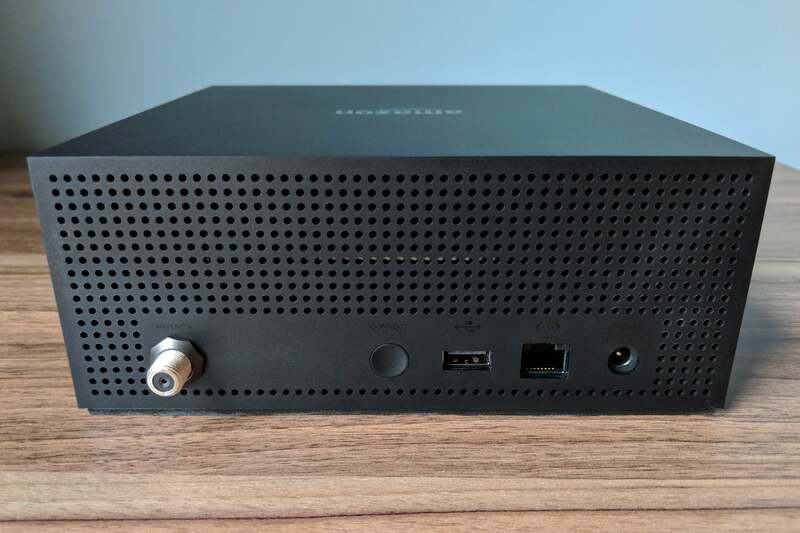 The Fire TV Recast solves this problem through its powerful built-in transcoder, which can convert interlaced channels to a maximum 720p resolution at 60 frames per second. Every channel therefore looks as smooth as it would directly from an antenna. The Recast also supports 5.1 surround sound, so using it doesn’t feel like much of a compromise compared to non-networked DVRs. 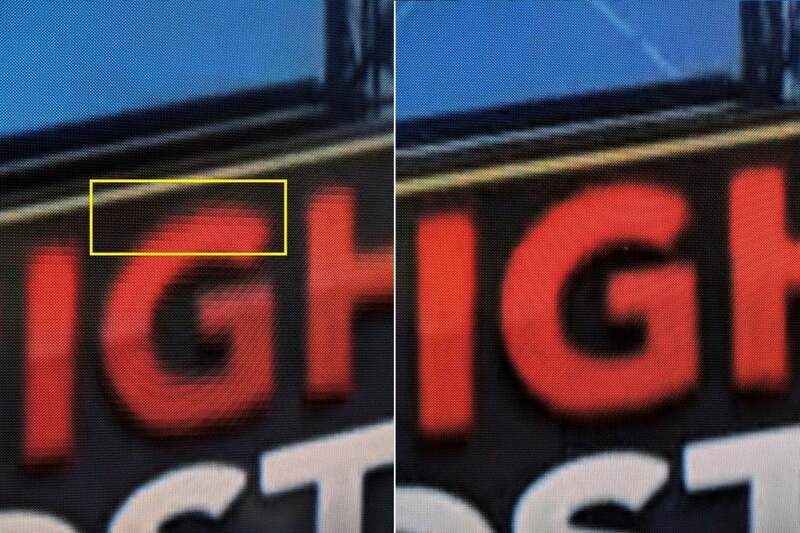 Stranger still, the Fire TV Stick 4K had some image pixelation that didn’t occur on Amazon’s third-generation Fire TV. This is apparently a bug that Amazon believes it has identified, though there’s no official timing on a fix yet. Pixelation on the Fire TV Stick 4K (left) vs. full broadcast quality from Channels DVR (right). Amazon says this is being fixed. The other limitations I haven’t mentioned yet pertain to out-of-home streaming. Currently, the Recast only supports remote viewing on iOS devices, Android mobile devices, and Fire tablets, so you can’t watch local TV on a Fire TV Stick while out of town. You also can’t download recordings to a mobile device for offline viewing, like you can with Plex and Channels DVR, and there’s no way to pull recordings off the Fire TV Recast like you can with Tablo Ripper. In light of everything the Fire TV Recast doesn’t do, I can’t recommend it as the best DVR for most people. That honor still goes to the Tablo Dual Lite DVR, which is about $100 pricier when you factor in an external hard drive and lifetime guide data, but it supports far more TV devices, including Roku’s popular streamers. If you don’t mind locking yourself into the Fire TV and Alexa ecosystems for the foreseeable future, the Fire TV Recast will give you a great interface for over-the-air DVR, smooth video, bountiful recording options, useful Alexa voice controls, and freedom from subscription fees. For its first shot at a DVR for cord-cutters, Amazon has done its homework—and has given the incumbents a lot to think about.